Two thousand, one hundred and ten years after the contest on Mt. Carmel, we see another king expectantly climbing up the Mount. He is not clothed in a toga-like robe but in glistening armor with a large Cross blazoned upon his shield and upon his breastplate. This king is the holy Louis IX of France who will become a canonized saint. He is interested in some most holy men who, he has been informed, dwell in the grottoes of the Mount and who call themselves “Hermits of Saint Mary of Mount Carmel.” Due to the gains of the infidels into Palestine these men are being forced to emigrate to Europe, since their sanctity is a byword, St. Louis want some of them for France. Some thirty years before Saint Louis came to Mount Carmel to persuade six of the hermits to return with him to France, two English crusaders took a few of the hermits to England. A strange but holy man joined them there in whom they could not help but recognize a great likeness to the fiery pro­phet whom they ever emulated. He took the name “Simon”; his surname, “Stock,” was symbolic of the life he had led prior to their coming: he had been dwelling alone in the vastnesses of an English forest in a tree-trunk hollow even as Elias had dwelt in Carmel’s natural caves. Our Lady, in a personal apparition, had told him that Her devotees were coming from Palestine and that he should join their society. The persecutions, which now were a tremendous force in Palestine and the reason for Saint Louis’ presence there, caused so many of the ‘Carmelites’ to move West that a Vicar General had to be ap­pointed there. Simon Stock received this honor. He found himself at the helm of Mary’s bark, in more than usually troubled waters. By the time he was made General of the entire Order, six years later (1245), it became apparent that nothing less than heroic faith was required to pilot the sea fearlessly. Adapting the heretofore contemplative Order to a mixed life, in a seeming awareness that a marked change was about to take place in the body of Mary’s special sons, the saint sent the younger men to the Universities. He thereby alarmed the old men who had led lives of utter solitude on Carmel. How­ever, he recognized that they had been providentially forced from Carmel and, guided by Mary, he braved the ugly dissension that his policy evoked. But this inward cancer was not the only affliction. Outside the Order, the whole secular clergy was rais­ing a din at the sight of another group joining the ranks of the odious mendicant friars [that is, the Franciscan Friars and the Friars Preachers or the Dominicans]; not only did they persecute the men from Carmel everywhere, but they carried their cries to Rome, demanding the suppression of these “newcomers.” Moreover, strange as it may seem, the barred-cloak, which these Pales­tinians wore, seemed violently to irritate Western sen­sibilities. Saint Simon thought to change it because the unpopularity of the Elian garb [the cloak of the friars patterned after the cloak of the Prophet Elias] was hindering the growth of his family of Mary; he refrained in deference to the views of the older members who naturally loved their ancient cloak, reminiscent of Elian traditions. For the first five years of his generalship, the opposition from within and without grew daily stronger. Hence, in the year of 1251 we find Simon retiring to the Cambridge monastery, weighed down by his ninety years and a trial well beyond the strength of even a far younger man. He seems to be seeking the solitude of his cell even as he had been wont to retire to his tree-trunk, in his youth, to pray. Probably he is thinking to himself, as Saint Teresa of Avila said later, “Can the hand of God be shorter for the Order of His Mother than for other Orders?”‘ And it is not merely a question of remov­ing obstacles that confronts the Saint now; it is a question of preserving the Order’s very life. “It was an illness in which Satan assuredly had a hand . . . He wished in his jealousy to avenge him­self on me for the grave mischief my family was to do him in the future . . . He little knew, however, that the Queen of Heaven was keeping a faithful and affectionate watch from above on Her Little Flower, and was making ready to still the tempest just as the frail and delicate stem was on the point of breaking” (“Story of a Soul,” Ch. 3). 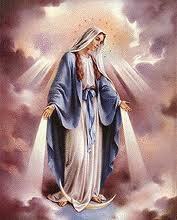 The purpose, the raison d’être, of that long estab­lished and special “family of Mary” stands revealed. After the Vision, an almost miraculous change took place in the “Order of the Blessed Virgin” (Our Lord in a colloquy with St. Teresa of Jesus, reformer of Carmel and foundress of the Discalced Carmelites). The Pope not only approved the Order but commanded that Ecclesias­tical censures be used against anyone who further molested its members. This utter reversal of attitude toward the Order is eloquent. In 1252, King Henry III issued letters of royal protection to the newly transplanted Order; the Sovereign Pontiff issued letters to all the Arch­bishops and Bishops whom his letters should reach, exhorting them to treat with more charity and con­sideration his beloved brothers, the “Hermits of Saint Mary of Mount Carmel” ; they were to receive grants of land and suitable monasteries and Ecclesiastical censures were to be used against those who would persist in molesting them in future. Victory? Yes, by the Scapular the Woman (Gen 3.15; Apoc 12.1) renders Satan impotent against us! “In the same way that Our Lord Jesus Christ wished that something visible would reveal in the Sacraments the invisible effects of His Grace, so also has Our Immaculate Mother of Carmel wished that the more particular protection which She accords to all those who serve Her with fidelity would be marked by an exterior sign, the Scapular” (Rev. Fr. Laselve, O.F.M.). “O Mary, who from that hour (that the Prophet Elias beheld the foot-shaped cloud over Carmel) didst preside over the watches of God’s army, without ever failing for a single day: now that the Lord has truly come through Thee, it is no longer the land of Judea alone, but the whole earth that Thou coverest as a cloud, shedding down blessings in abundance. Thine ancient clients —the sons of the prophets—experienced this when, the land of promise becoming unfaithful, they were forced to transplant their customs and traditions to other climes; they found that even into our far West the Cloud of Carmel had poured its fertilizing dew, and that nowhere would its protection be wanting to them … Since their tents have been pitched around the hills where the new Sion is built upon Peter, the cloud has shed all around showers of blessings more precious than ever, driving back into the abyss the flames of Hell . . .” – Dom Gueranger, O.S.B. Presenting the Scapular to St. Simon Stock for the world, Our Immaculate Mother makes but one condition to Her promise of salvation: “Whosoever dies clothed in this Habit shall not suffer the fires of hell.” She promises then that anyone who enters Her family of Carmel, and dies there, shall not suffer the fires of hell. Orthodox Catholic theologians and authorities like Vermeersch, St. Robert Bellarmine, Beringer, Pope Benedict XIV, and others, explain the promise to mean that anyone dying in Mary’s family will receive from Her, at the hour of death, either the grace of perseverance in the state of grace or the grace of final contrition. To die in the membership of Mary’s family is the one condition. Now, in order to so die – either having been enrolled in the Confraternity (see the “Confraternity Membership” in the Group’s Documents section) or having been admitted as a Friar, Nun, or Tertiary – one must die clothed in the sign of membership, that is, the Scapular. Our Lady’s promise does not mean a removal of God’s sanction of moral law, i.e., that regardless of what we do we shall not be eternally punished. Saints and the Roman Pontiffs warn us of the foolhardiness of abusing Mary’s promise. Pope Pius XI warned all the faithful that “although it is very true that the Blessed Virgin loves all who love Her, nevertheless those who wish to have the Blessed Mother as a Helper at the hour of death, must in life merit such a signal favor by abstaining from sin and laboring in Her honor” (Letter on the Occassion of the Sixth Centennary of the Sabbatine Privilege,” March 18, 1922). One can take it as certain that if he continually sins because of Mary’s Scapular promise, he shall not die in the Scapular. To lead a sinful while trusting in the Scapular promise is to commit a sin the horror of which borders on sacrilege; its punishment will not only be eternal but far worse than of one had led a sinful life without making the Mother of God an excuse for crucifying Her Son time and time again. There are times when a person is tempted to some great sin, such as impurity (which, according to Our Immaculate Mother in Fatima, Portugal, draws souls in such great numbers to hell) that the suggestion comes: “Why not do it? You wear the Scapular and after this moment is passed you will still have no fear about your eternal salvation.” It is certainly Satan using the Scapular promise to draw a soul to sin, a worse sin that the act itself. Like all sin, it can become a habit. A typical and warningful example is found in a certain well-testified Scapular miracle. A man openly excused a wicked life by boasting that he wore the Scapular; he claimed surety of salvation while he disedified his neighbors by abominable excesses. He persevered in this presumptuous belief until death overtook him. Then those whom he had disedified became witness to an event that has not been uncommon in the years that men have sought to realize Mary’s promise. As death approached, the poor wretch thought that the Scapular was the cause of his agony. He cried out painfully that it was burning him. In a last supreme effort, tearing it off, he flung it from him… an went to see the Divine Judge (from P. Huguet, “La Devotion a Marie en exemples,” Vol. II, p.62). Our Blessed Mother’s promise is the masterpiece of Her motherly love. It was made to be a source of hope and confidence to us. In the supreme moment of our lives – the moment when we feel this earth slipping away with all that it has meant to us while a strange life yawns at our feet into eternity, we need a mother. Probably, it was at the foot of the Cross, the moment when Her Divine Son made Her our Mother in a gesture of death-parting, that Mary thought to assure us of a Mother’s love at our dying moment. Soldiers cast lots over the earthly garments She ad made for Her Crucified Redeemer; She would make a heavenly garment for Her Blood-purchased redeemed. The Scapular is a miniature habit – that is, it is the habit or garb of the Friars and Nuns of the Most Blessed Virgin Mary of Mt. Carmel reduced to a form that can be worn in the daily life of the faithful who desire to unite themselves to the “Order of the Virgin” (Our Lord in His colloquy with St. Teresa of Jesus – reformer of Carmel and foundress of the Discalced Carmelites, also known as the Teresian Carmelites), to partake of our Teresian Carmelite spirit and thereby becoming sharers as well of our spiritual treasures. “Whenever someone begins a new stage of life, it does not happen automatically, but rather by means of a decision and an intentional act. For example, a man decides on a career and signs a contract with his employer. Or he chooses his state in life and seals this decision with a wedding ceremony, priestly ordination, or religious profession…” (Rev. Fr. Karl Stehling, SSPX, “The Immaculata Our Ideal,” p. 100). In a similar manner, those who enter also the Teresian Carmelite Family of Our Blessed Mother through the Scapular Confraternity seals their decision but through Total Consecration to the Immaculate Heart of Mary and its cause of which the Scapular is its sign. It is therefore of great importance in the acquiring of perfection (Be ye perfect as your Heavenly Father is perfect ), which it must be remembered is only acquired by union with Our Lord and Him Crucified, to empty ourselves of everything that is not Him. In order to empty ourselves of ourselves, we must die to ourselves daily (1 Corinthians 15.31) by our conformity to God’s will just as the Mother of God had said: Behold the handmaid of the Lord. Be it done to me according to thy word. Here we hand over our whole life to Our Lord by the hand of Our Blessed Mother: all the powers of our soul, that is, our understanding, our will, and our memory, along with all the powers of the body, namely, all the senses and energies, health and sickness of our whole life we commend to her with all its pleasant, unpleasant and indifferent incidents . If we die not to ourselves, and if our holiest devotions do not incline us to this necessary and useful death, we shall bring forth no fruit worth anything, and our devotions will become useless. Often we come to know Our Blessed Mother’s wishes through inner promptings, but we can almost never be sure whether these come from her or from our self-love or even from the devil. Satan in the form of an angel of light (2 Corinthians 11.14) is sometimes able to deceive us with the holiest things, which could perhaps be good for someone else, but which God does not want of us. Even if we were to have a vision and thought that the Mother of God was appearing to us and assigning us the most exalted task, how do we know for sure that it is really She and not a deception or a diabolical snare? “The best test is obedience to one’s superiors” (St. Maximilian Kolbe, Militia Immaculatae). “One carries out a command,” continues the Saint, “not because it is pleasant, reasonable, wise, or holy in itself, but rather because the command is the will of the superior and accordingly the will of Our Immaculate Mother, and therefore ultimately God’s will. Without this attitude one is not an instrument in the hand of Our Blessed Mother, but rather – I declare it openly – an instrument in Satan’s hand, however many spiritual books one may read, however many Rosaries one may pray, however many great deeds one accomplishes.” The living Teresian Carmel, and the Confraternity of Our Lady of Mt. Carmel attached to it, in practice, consists of this ‘holy’ obedience (that is, grounded on the truths of the Faith for we walk by faith, 2 Corinthians 5.7). Eight hundred and sixty years before Christ, the whole of Israel, at the bidding of the fiery Prophet Elias, is assembled, with the prophets of their false god, there on the summit of the Scripturally renowned Mount Carmel. The Jewish nation has fallen into idolatry and the Prophet of Carmel – who was dwelling in one of the caves of the Mount – proclaimed before the king and the adulterous nation: How long do you halt between two sides? If the Lord be God, follow Him: but if Baal, then follow him (3 Kings 18.21, DRV). Then the Prophet proposed a contest: Call ye on the names of your gods, and I will call on the name of my Lord, and the God that shall answer by fire [to consume the holocaust on the altars of both sides], let Him be God (v.24). Midday at the Mount was already past, and Baal has not yet answered. The Prophet Elias then repaired the altar of the Lord, that was broken down and he built with the stones an altar to the name of the Lord…When it was now time to offer the holocaust, Elias the Prophet came near and [prayed]… then the fire of the Lord fell, and consumed the holocaust, and the wood, and the stones, and the dust, and licked up the water that was in the trench [around the altar] (vv. 30,36,38). And all the people… fell on their faces (v.39) acknowledging that the Lord he is God. However, it is not so much for the fire-contest between the prophets and the Prophet or rather between God and the false gods that we interest ourselves in this event but for the after-event. After that the Prophet Elias brought down a miraculous fire from heaven, he turns to Achab, then king of the Jewish nation, and says that there is now a sound of abundance of rain (v.41). And while the king goes to eat and drink at the Prophet’s bidding, we follow the Prophet as he proceeds to the top of Carmel. Then the Prophet Elias casting himself down upon the earth put his face between his knees (v.42) and tells his young servant to go and look out over the Mediterranean sea; six times we see the servant return only to report to his venerable master: There is nothing (v.43). At this very moment, the Prophet of Carmel is not only about to present a material salvation to the famished adulterous nation [in chastisement for their crime] but is also about to behold a prophetic vision of the spiritual Salvation of all mankind through an Immaculate Virgin. We see the servant return the sixth time to be again sent by the Prophet to go up and look towards the sea (v.43). The seventh time, he hastens back for, rising out of the sea at the foot of the Mount, he has seen a little cloud…. like a man’s foot (v.44). In the near morrows, saintly Doctors of the true Church will explain to the world how this little cloud is a figure of an Immaculate Virgin who will rise pure out of the sea of humankind, free of its universal impurity of original stain. It was a vision of the Woman (Apocalypse 12.1) who was to arise immaculate – full of grace (Luke 1.28), all fair… and there is not a spot in [Her] (Canticle of Canticles 4.7) – and to crush with Her foot the head of Satan (cf., Genesis 3.15). As soon as the Prophet is told of the little cloud like a man’s foot ascending, we see him rise to give a command to the king. And within a short while, behold the heavens grew dark, with clouds, and wind, and there fell a great rain (v. 45). God had not said of the Immaculate, who was to rise pure out of the human see which Satan had tainted at its very source in Paradise, that there would be enmities between Her alone and Satan alone; He also said: Between thy seed and Her seed (Genesis 3.15). So upon the appearance of the Sign of the Immaculate crushing the head of Satan – his head referring to his pride – with Her heel – Her heel referring to the humility of Our Immaculate Mother of Carmel – we naturally expect to see Her bring forth Her seed to fight and conquer with Her. And She has. The Immaculate Virgin of Carmel has clothed us today in the Scapular – a Sign of Her: the humble Mother, the Victorious Queen. For is it not at once the Sign of Her seed and a Sign of Victory? Our Immaculate Mother Herself answers this when at Her last apparition at Fatima, Portugal in October 13, 1917 She appeared as Our Lady of Mt. 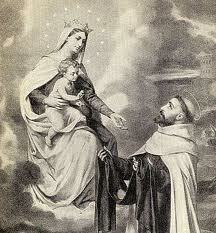 Carmel holding out to the world Her Scapular [see our blogpost “The Great Sign in Heaven”]. Does not Satan hate us with every bit of hatred he has for Her [And the dragon was angry against the Woman: and went to make war with the rest of Her seed, who keep the commandments of God, and have the testimony of Jesus Christ (Apocalypse 12.17)]? Yes, and he hates this Sign which at once proclaims us to be the seed of Mary and crushes his pride by its simplicity – being a mere brown woolen pieces of cloth – and invincible power [as countless authenticated records show of the same miraculous power attached to it]. God brings to nothing the things that are by things that almost, as it were, are nothing; He places the head of the black prince of the world beneath the heel of that humble Virgin who started to defeat with Her simple words: Ecce ancilla Domini, fiat mihi secundum verbum tuum [Behold the handmaid of the Lord, be it done to me according to thy word. ](Luke 1.38). Although Satan lies in wait here on earth to sink the fangs of cunning temptations into our hearts, Our Immaculate Mother of Carmel, through a devotion so simple, protects us and conquers Satan for us. When we enter into Our Immaculate Mother’s alliance we can almost feel that best of mothers folding us to Her breast to guard us in life, at death, and even after death until She has completely brought us to eternal happiness. As we stop to consider it, do we not feel a burning desire welling up in our hearts, a longing to respond to such love? Do we not feel, as it is only human for a child to feel, a spiritual thirst to answer Mary’s motherly action of fighting the ancient infernal serpent which lunges at us, to take Her very sign of salvation, and with prayer, sacrifices [an intimate union with Her Son Crucified, see consideration for the “Ninth and Last Day of Novena to Our Lady of Mt. Carmel], and the [traditional] Sacraments of the Church, to enter into the fray? Even as the rainfall was the salvation of Israel of Old after the prophetic sign of the Immaculate, so we may cause another humble Sign of Victory to become truly the salvation of the world through Her. By using the Scapular to make frequent acts of ‘mystical’ union with Our Immaculate Mother, “Vanquisher of Satan,” we become, according to St. Louis-Marie de Montfort, “those servants, slaves, and children of Mary: a burning fire of the ministers of the Lord, who shall kindle the fire of divine love everywhere, and ‘like sharp arrows’ in the hand of the powerful Immaculate Virgin to pierce Her enemies; the sons of Levi, well purified by the fire of great tribulation, and closely adhering to God through His words, laws, and Commandments; who shall carry the gold of Christian charity in their heart, the incense of prayer in their spirit, and the myrrh of mortification in their body; and they shall be everywhere the good odour of Our Lord Jesus Christ to the poor in spirit and to the little, while they shall be an odour of death to the great, to the rich, and to the proud. Our Dearest Immaculate Mother has marked us for Her elect, members of Her family. Our Heavenly Mothers thirsts for souls because the Sacred Heart of Jesus thirsts and has given the mission of assuaging that thirst to Her and to us through Her. Being the Head of that divine Body, the Church, He has made His Mother the neck and us the members. His Sacred Heart is the Driving Power. Mary’s Immaculate Heart is one with It so that we, Her children, may be one with It simply by being united to Her through our total consecration to Her Immaculate Heart – of which Her Scapular is the badge of it. That is our vocation, our apostolate, our purpose. May God bless and keep you all in His light, grace, mercy, aid, and protection through the intercession of the Immaculate Heart of Our Dearest Mother of Carmel! A Blessed Feast to All! I simply desire to read completely new ideas from you site.